Para alpine skiing is one of two original sports from the first Paralympic Winter Games in 1976. Since those first Games in Örnsköldsvik, Sweden, the sport has expanded to feature a diverse array of fast-paced events. There are five individual alpine events at the 2018 Paralympics — downhill, slalom, giant slalom, super G and alpine combined. For each event, athletes are divided into three categories depending on their classification: standing, sitting and visually impaired. Technical events: Slalom and giant slalom courses emphasize turning technique, with competitors getting two runs. So what makes one type of skiing a speed event and another technical? It comes down to the course layout. Downhill, as the name implies, has few turns to maximize speed down the hill and has the longest course of the events. On the opposite end of the spectrum, slalom events have the quickest, sharpest turns on a short course. Giant slalom has fewer gates and wider turns, while super-G (super giant slalom) combines the turns of a giant slalom course with the speeds of a downhill event. In the combined event at the Paralympics, competitors must demonstrate their prowess in both speed and technical events by taking on one downhill or super-G run and one slalom run. Skiers in the visually impaired classification compete with a guide who skis ahead of them. The guide communicates with the skier via headsets to help navigate through the course. Athletes in the sitting classification compete in sit-skis, which are specially designed chairs on top of a single ski that have shock-absorbing capabilities. Competitors can also use outriggers — poles designed with small ski blades at the bottom — for additional balance in lieu of traditional poles. There are 30 medal events at the Games in Pyeongchang (15 men's events and 15 women's). Canada won eight alpine medals at the Sochi Games, including three by Mac Marcoux. The 20-year-old from Sault Ste-Marie, Ont., took home gold in giant slalom and earned bronze in the downhill and super-G events. 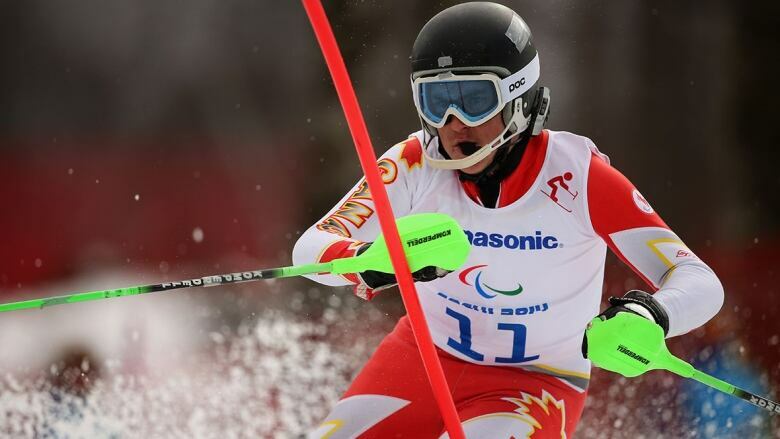 Marcoux, who competes in the visually impaired category, earned his previous Paralympic medals with guide Robin Femy, but has been skiing with Calgary's Jack Leitch since the 2016-17 season. Alana Ramsay is an emerging alpine presence for Canada, having won four medals — one silver and three bronze — at the 2017 world championships.These will be the second Paralympics for the versatile 22-year-old skier from Calgary.